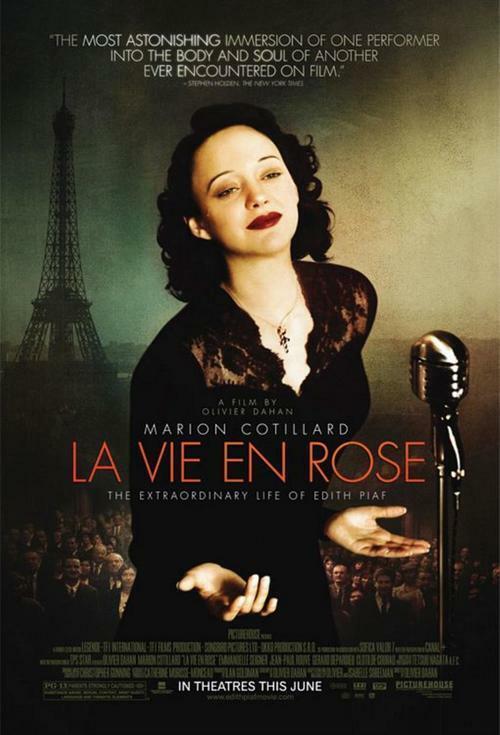 Writer/director Olivier Dahan (Crimson Rivers II) helmed La Vie en Rose, the screen biopic of tragic French songstress Edith Piaf. Marion Cotillard portrays Piaf, the superstar once raised as a young girl by her grandmother in a Normandy bordello, then discovered on a French street corner -- as a complete unknown -- by cabaret proprietor Louis Leplée (Gérard Depardieu). The film segues breezily between various episodes from Piaf's life -- such as her lover, French boxer Marcel Cerdan's (Jean-Pierre Martins) championship bout in mid-'40s New York; her period in Hollywood during the '50s; Piaf's abandonment as a young girl by her contortionist father (and earlier by her mother, a street singer); her brushes with the law as an adult; and her 1951 car accident and subsequent morphine addiction that caused her to age well beyond her years and left her barely mobile; and, through it all, her ability (like Billie Holiday) to funnel personal tragedy and emotional struggles into her vocalizations -- dazzling audiences in the process.